Our client in this instance was an architectural practice, Bryden Wood Architects. 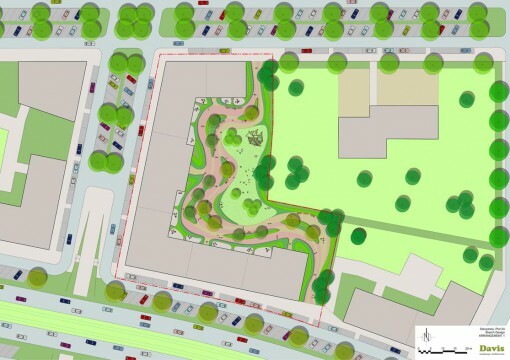 We were appointed as landscape architects to provide typical landscape design options for a typical plot on this £1bn, 15,600 apartment mixed used development located in Gutenborg, Russia. The landscape architect ‘s information provided formed part of the architect’s main bid submission to develop a chassis design. We believe the supporting role of our landscape architects and the considered landscape design was critical to the team’s successful bid. 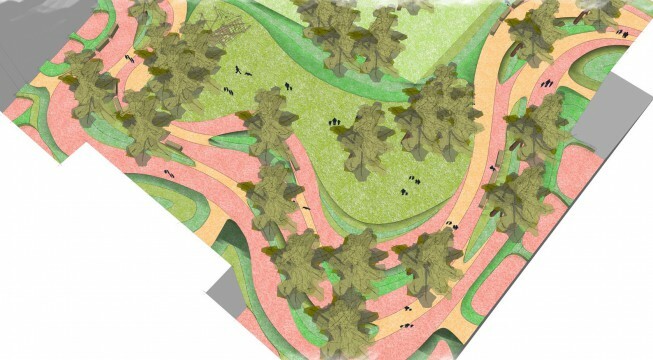 Our output was landscape architect ‘s sketch plans with associated planting palettes. As each ground floor unit had a private patio area which fronted onto the public realm, our landscape architects needed to carefully consider the privacy issues associated with this type of interface. Privacy was achieve by a specifying a decent depth of planting, the selection of appropriately high plant material and an appropriate hard boundary treatment at the edge of each patio zone. The landscape design for the public open space design need to accommodate a variety of activities. These included pedestrian circulation, areas of children play, relaxation zones and active zones. Street furniture, including seating and lighting, also needed to carefully considered and located so as to create a usable and meaningful spaces within the public realm. Our landscape architects were also tasked with the specification of a palette of plant material which would thrive and look good in the cold winters found in this location. Our landscape architects specified a combination of native and non native ornamental plant species. Our intention was to provide attractive all year round interest whilst providing benefit to the local fauna. Our concept design for this space was drawn from the adjacent Neva River. 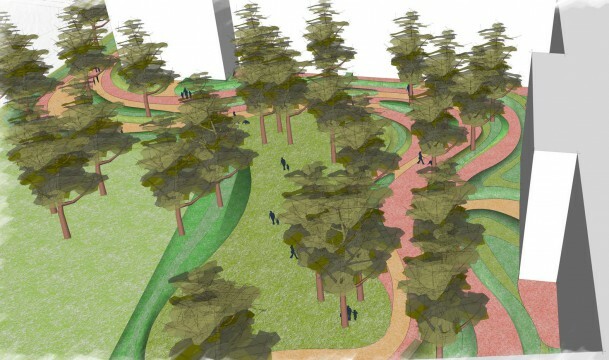 Our landscape design was evocative of a fluid river flowing around islands of planting and areas of public open space. The paving pattern helped to emphasise the flowing nature of a river.